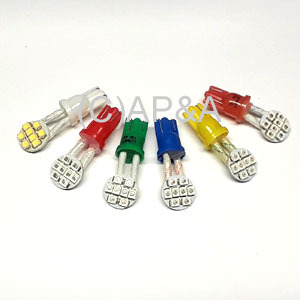 Flexible-lead LED replacements for large 12-volt #906 incandescent flash lamps used in most makes/models. Features multiple individual LEDs on top which provides a bright, crisp light when illuminated. Replaces Bally/Williams # 24-8802 and similar others. Flex LED replacement bulbs have 2 flexible wire leads that allow you to position light in any direction you need it. They work best under playfield inserts that use horizontally-mounted light sockets, allowing you to turn, twist, and position the LED directly up through the playfield insert after installing the bulb in the socket.